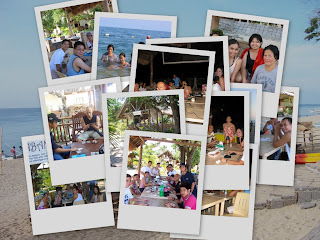 The last company outing I went to was five years ago so I was pretty excited when my company planned to go to Sabangan Beach Resort two Saturdays ago. It is located at Laiya, San Juan, Batangas, which is a three-hour drive from our place of work. We rented a van for the trip but those who brought their families with them decided to bring their own transportation. Our check in time was 12noon so we met up early in the morning at the office. I was even a little late because my alarm did not go off. Good thing they waited for me and we didn't get delayed much. We arrived at the resort a little before lunch time so we were able to rest before we had a hearty meal of pork adobo, shrimps and crab. Yummy! After lunch, there was supposed to be some team-building activities but that didn't happen because everyone wanted to do different things. Some went straight to the beach, some played cards, some lounged around and some stayed in the air-conditioned cottage and watched TV or slept. In the late afternoon, a volleyball game was organized. I didn't join because I never liked the game, but it was fun watching my officemates play. Dinner was a buffet of rellenong bangus, beef caldereta, misua and fresh fruits. Again, a delicious feast, I must say. My boss brought her Magic Sing so after dinner, a television was brought out from one of the rooms and we started singing the night away. There was also beer so those who didn't join the singing just played cards while drinking. We ended at around 2am. I woke early the next day because the girls had to prepare breakfast. I made 24 sunny-side ups and I was pretty proud of myself. The longganisa was already pre-cooked so we just had to reheat it. We also reheated the pork adobo from the day before and incorporated some of it into the sinangag. Breakfast was a mix of eating and recalling the night before as well as laughing about a certain "embarrassing moment" by one of our officemates. Some went back to the beach after breakfast but I opted to go back to the cottage to take a bath and pack my bags. We checked out at just before noon and headed back to Manila. Pacquiao had a fight with Solis that day but since we were on the road, we just contented ourselves with listening to the radio for a blow-by-blow account of the boxing match. By the time we stopped at Grace's Restaurant in Laguna for lunch, the fight was about to end. But before that we already knew who would win; Pacqiao of course. The restaurant had a pasalubong counter so I bought some uraro, macapuno, pastillas and boat tarts. The rest of the ride was fairly quiet as most of us slept. We stopped at the office to drop off some things and then the van dropped us off where it is easiest for us to go home.